Small Get-Together? Roasting is the way to go! When I have a small get-together of 6-8 people, I usually like to do a roast. The prep work is very minimal. After I prep it, which takes no time at all, I just pop the roast into the oven and the aroma will fill the room as I set the table and do the decorations to get ready for the party. I’ve chosen this beef roast because all sides are incorporated into the roast. 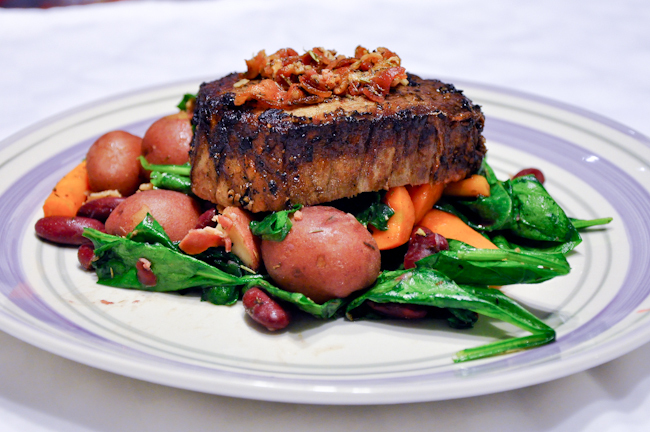 The tender roasted red potatoes and the sweet carrots with fresh spinach go perfectly with the beef. The combination of thyme, rosemary and bacon topper is just incredible! The other great thing about a roast is that everyone can choose how well done they want their meat to be. The outer edge pieces are usually well done, while the centre is medium rare. I am sure once you serve this, you will leave your guests hungry for more!